for when you want to position the dispersion of light from the LED Tube to a specific angle. 240V AC Mains Power is fed as Live at one end and and Neutral at the other end. Single tube fittings require no modification to the fitting other than simply removing the starter by disconnecting it from the fitting. Fittings with Electronic Ballasts require modification by feeding Live at one end and and Neutral at the other end of the tubes. 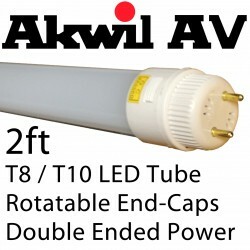 We have a large selection of LED tubes to replace 2ft. 3ft, 4ft, 5ft, 6ft and 8ft fluorescent T8, T10 lighting. Warm White (2800-3000k), Natural White (4000-4500k), Cool White (6000-6500k) Colour Temperatures are available with either diffused or clear lenses to suit your requirements. 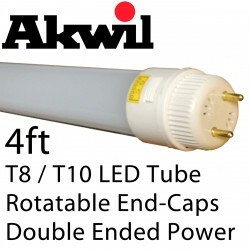 You can click here to enlarge or download the Akwil LED Tubes High Brightness Series PDF file. 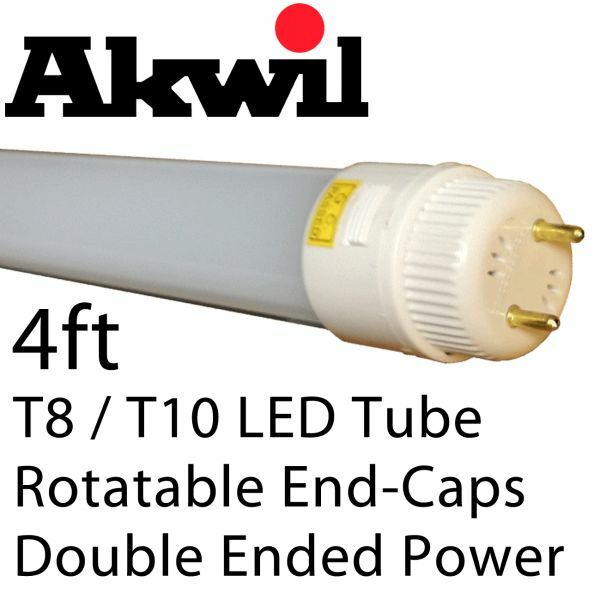 Our LED Retrofit Tubes are more energy efficient than a T5 fluorescent replacement. - Remove the need of future repacement purchases for 65000 hrs.